Tivoli's latest Model DAB is easy to categorise in the busy world of DAB radios - it's a posh version of Pure. You'll see Pure's DABs everywhere and they're mostly fabulous value for money, but what Tivoli has presented to us here is one of the few high-end DAB radios. Immediately obvious is the Model's single mono speaker, which oddly, sits atop the unit. Happily, an auxiliary speaker (which even has its own alarm and controls) is available for £65, although that's pushing the total cost to £300 - a lot of money compared with the crowded £100 price range of DAB radios, many of which we've positively reviewed. So, are we being conned by this DAB? Charmed, more like. 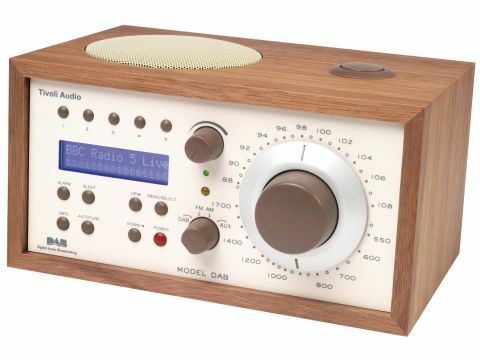 The Model's wood and cream finish is delectable and the overall build quality is far higher than most plastic DAB radios. Buttons, knobs and dials have been designed with a lot of thought and operate smoothly. This DAB radio should last for years. Inside the Model is not just a DAB tuner, but also options for FM and AM stations. The latter analogue signals tune-in and hold really well and are operated using a huge dial upon the front. It's a nice retro nod that's executed properly. On some radios its inclusion works merely as an insurance policy, but the FM tuner is crucial for this unit. Because of its wondrous audio talents (more of which later), the Model can play fabulous quality music in FM. But DAB is better quality, surely? More convenient, yes, but DAB can't beat a good FM reception, especially for music. Blame the low bitrates that DAB is broadcast in across the UK. The Model still takes DAB signals and pumps out excellently rounded sound. It's not the most precise in the world, but there's a lot more depth and bass than from most DAB radios we've listened to. Tivoli also offer an add-on subwoofer that can be attached using a dedicated output on the unit's rear. We had a go on this added extra, and while it does transform the Model into a mini hi-fi of serious quality, the main unit itself is designed to deliver ample bass. It does prove its worth when we attached an iPod using the Model's phono input (another nice extra) by beefing-up the sound of MP3s. The Model is also a breeze to use. Navigating the various DAB stations available on the local multiplex is a cinch, although the provision of just five presets for favourite stations seems stingy. No doubts, this is one of our favourite DAB radios, but we've got serious reservations about its value. But, if you absolutely want the best and might consider buying the extra speaker and subwoofer, you won't regret it.